The 2014 college football season marked the beginning of a bright new era for a sport which had already been experiencing a rapid recent growth in popularity. For years, countless fans and analysts had one major gripe that they continually clamored about: the lack of a playoff system to determine a true champion. This past season, their wish was finally granted when the sport introduced its new four-team playoff system. Although the first ever playoff wasn’t without its fair share of controversy (TCU and Baylor fans certainly didn’t appreciate the fact that their teams were left out), the overall consensus was that it was a remarkable success. 33.4-million people tuned to ESPN to watch Ohio State beat Oregon for the national title, which was the second highest audience ever for a college football championship game. With profits, television ratings and fan interest all on the upswing, the future of the sport looks as a bright as ever. Still, no matter how successful an industry may be, there’s always room for continual improvement, and college football is no different. Ever since I became a college football writer back in 2010, I’ve always had an avid interest in coming up with ways to make changes to the sport’s conference structure, postseason system and other important facets of its overall framework. Since then, the main pet project in my life has been coming up with ways to improve and strengthen college football and help come up with ways for the sport to grow and prosper into the future. Since coming up with an original power-conference plan back in the summer of 2010 (one I admittedly now consider quite dated and flawed), I’ve filled countless notebooks, folders and computer files with maps, stats, bowl scenarios, schedules, imaginative conferences and all sorts of different season formats, all while trying up to come up with a system I felt could actually be applicable and successful in the real world. Recently, after years of continual evolution, the plan has finally reached a stage that I’m sufficiently satisfied with. I’m excited enough about a few of the creative breakthroughs and revelations I’ve had to want to publish it and share it with the sports world. Still, I view this article as something comparable to a rough draft. It’s a starting point and by no means a finished product. It does, however, encompass most of the main points I want to convey about the changes I believe should be made to the current system. So here it is: The complete college football super conference system blueprint. I’ve kept the five power-conference format intact, only I’ve made them five two-tiered superconferences of 30 total teams (15 teams per tier), and brought the number of total FBS teams to 150. The five leagues (Eastern, Atlantic, Western, Southeastern and Heartland) are all mainly based on different geographic regions. The regular season is 17 weeks long, plus there’s one exhibition weekend. It starts in mid-August and lasts until mid-December. Each team plays 16 regular season games (14 conference games and two out-of conference games) and they are each awarded one bye week. Tier 1 schools and Tier 2 schools compete exclusively against each other during the regular season. There are no conference championship games. Instead, at the end of the season, the top Tier 1 team with the best overall record from each of the five leagues is declared conference champion and earns an automatic bid into the eight-team postseason playoff. A panel of experts then extends three wildcard bids to the three best non-championship-winning Tier 1 teams and seeds all eight teams based on their overall resumes to compete in a three-round, seven-game, eight-team playoff. So now let’s break down each of the main parts of the plan (conferences, season structure and postseason format) in greater detail to hopefully make it more easily understandable. When attempting to split up the conferences and form a feasible league structure, I’ve always tried to adhere to three main goals. There have been countless iterations that I’ve come up with throughout the years (everything from four conferences of 16 teams per tier to eight conferences of 10 teams per tier to three tiers of 10 teams each). Not wanting to make dramatic changes to the system currently in place, I’ve settled on the belief that the best course of action would be to stick with the current “power-five” conference structure. I would, however, make a few necessary tweaks to strengthen the structure, which is why I feel the 5*15*2 format is best. The fact that each of the five most prominent conferences in college athletics has a different amount of teams (two of which don’t even match up numerically with the actual name) is a big problem in my eyes. We saw this play out this past season when two worthy potential playoff contenders—TCU and Baylor—were downgraded and left out due to the fact that the Big 12 only has 10 total teams. I also am not a big fan of the divisional format that the ACC, Big Ten, Pac-12 and SEC have all switched to. Since four out of the five power conferences employ a divisional format, we now have a system in place where there are routinely teams that are crowned as conference champions even though they failed to play some of the toughest opponents in their own league. For example, this past season, Alabama didn’t get the chance to prove itself against a 10-win Georgia team, Florida State never played a nine-win Duke team, Oregon never matched up with a 10-win Arizona State team and Ohio State never squared off against a nine-win Nebraska squad. How can a team be considered a true definitive “conference champion” if it doesn’t even play one of the best teams in its own league? Now that I’ve complained enough about the current structure, here’s how I’d fix it. The main inspiration for a two-tiered system comes from the English Football League’s current hierarchical format. It’s the type of system that would be very suitable for the current state of college football. Case in point, although there are always a few “little guy teams” a la a Boise State who make noise every season, for the most part, the college football world is increasingly becoming a society where there’s a noticeable dividing line between the power programs and the smaller schools. That’s due mainly to the dramatic differential in athletic department budgets at bigger schools compared to their smaller counterparts. So I say let’s turn that figurative dividing line into a real one and even the playing field. We do that by having the top five power conferences absorb the five so-called “mid-major” conferences (American, Conference USA, MAC, Mountain West, Sun Belt) and become five, two-tiered superconferences. 150 total teams — 75 teams in each Tier. During the regular season, teams compete exclusively against teams from within their own tier. The exception will be during the exhibition weekend in mid-August when every Tier 1 team hosts a Tier 2 school from their conference for one preseason exhibition game. The result and stats from the exhibition game don’t count, but the visiting Tier 2 team does get a portion of the gate revenue. The exhibition weekend would be a much better option than the current trend of teams padding their non-conference schedule with inferior opponents. Plus, since Tier 1 teams would be playing exclusively against each other during the regular season, there would be a higher frequency of solid matchups every weekend. Like the English Football League’s structure, there will always be constant transition and reshuffling after every season. The five Tier 2 conference champions will be promoted to Tier 1 for the next season, while the Tier 1 teams with the worst record in each of the five leagues will be relegated to Tier 2 for the next season. Only the 75 teams competing on the Tier 1 level will be eligible to compete for a berth in the eight-team playoff. But the beauty of this system is that even the smallest of Tier 2 schools will always potentially be one great season away from having their shot to compete with the big boys. 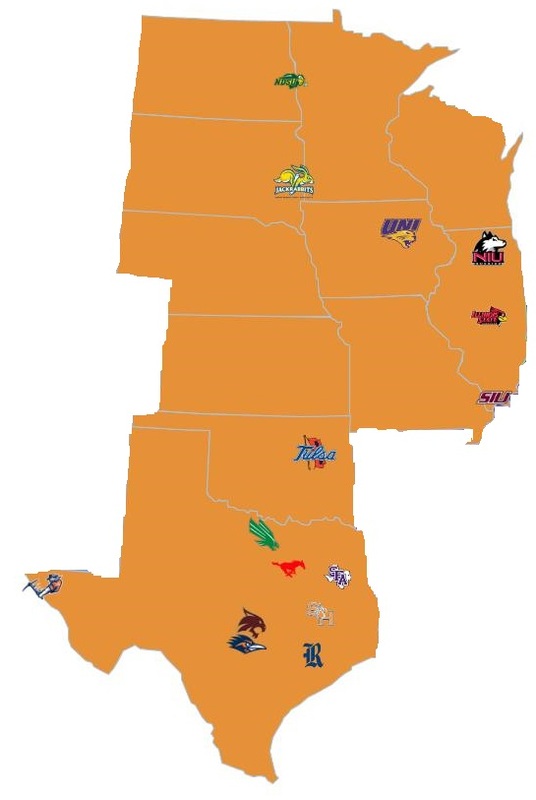 To get to 150 total teams, 20 programs would have to be promoted from the FCS level. The teams I chose were Charlotte, Chattanooga, Coastal Carolina, Delaware, Eastern Washington, Illinois State, Jacksonville State, James Madison, Liberty, New Hampshire, North Dakota State, Northern Iowa, Richmond, Sam Houston State, Stephen F. Austin, South Dakota State, Southern Illinois, Villanova, Youngstown State and William & Mary. 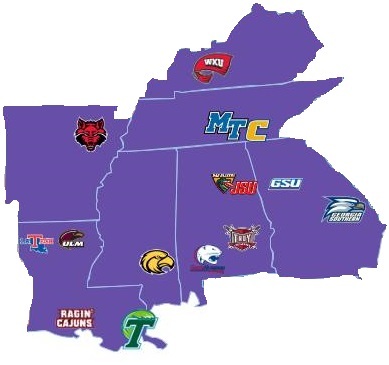 All are solid and successful FCS programs, which all have the resources and facilities to handle the transition to a higher level of competition. 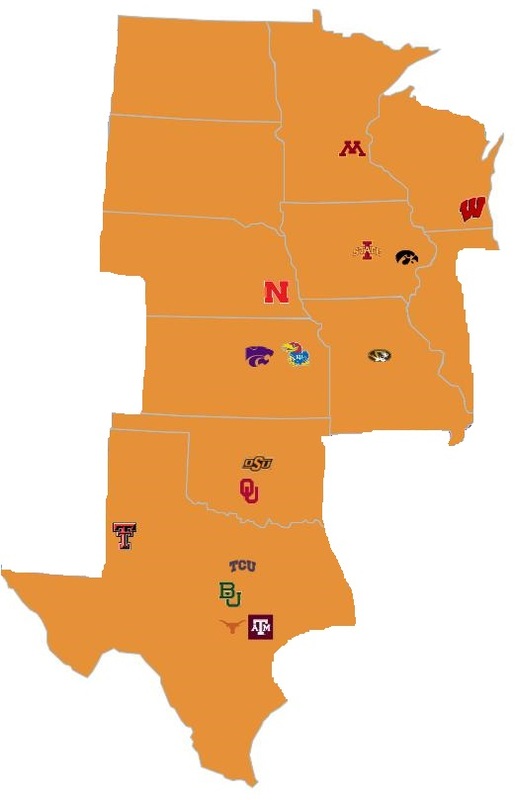 To get to 75 total Tier 1 teams, I had to promote 11 teams that aren’t currently affiliated with a Power-5 conference. The teams I chose were Boise State, BYU, Central Florida, Cincinnati, Connecticut, East Carolina, Fresno State, Houston, Memphis, Notre Dame and South Florida. 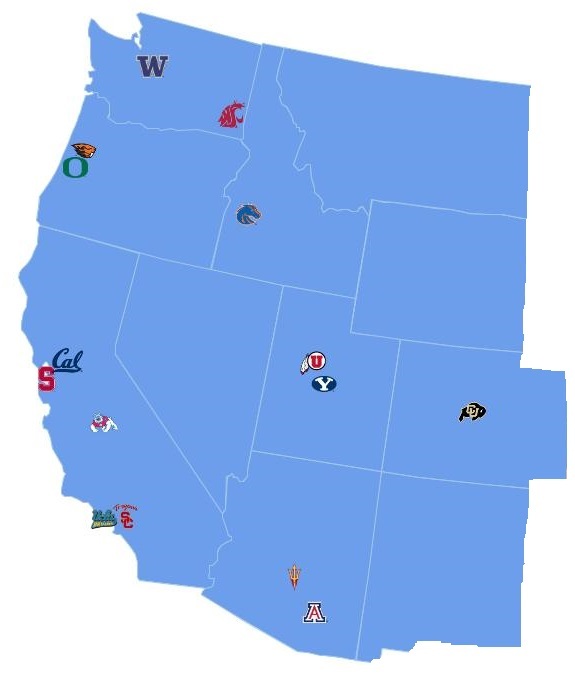 Here’s how I would split the five superconferences up to create a new landscape for the sport. Now, back to the three goals I talked about. 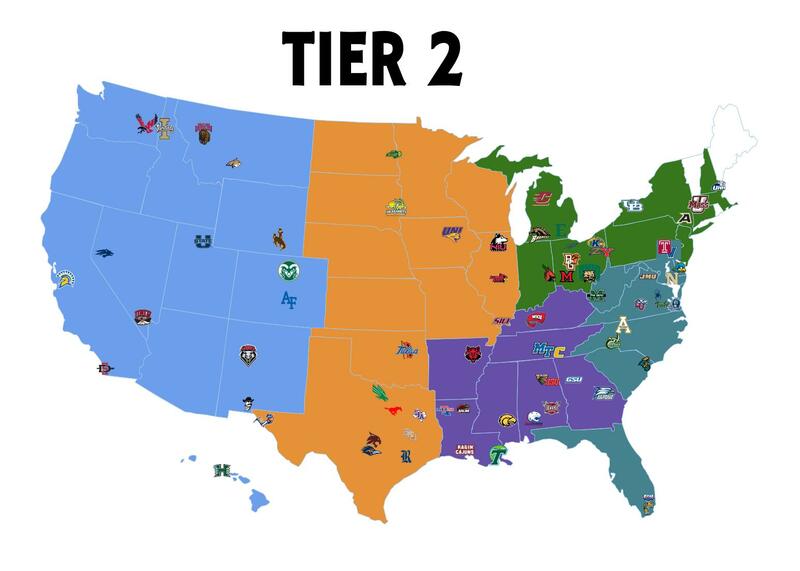 Obviously, all the conferences are equal (30 total teams, 15 teams per tier). In my view, they’re sufficiently sensible from a geographic standpoint, as each of the five conferences covers a main region of the country. The only real question is how even are they in terms of overall strength? To determine the strength of each conference, I focused on the Tier 1 teams and tried to measure how successful they’ve been over the past five seasons (2010-2014). To do this, I used Jeff Sagarin’s final ratings from those seasons, the average win total of each team in each of the past five seasons and the number of total appearances that each team has had in the final AP Top 25 poll in each of those seasons. Here are the cumulative results based on all five seasons for each conference’s 15 Tier 1 teams. As you can see, with this formula, the Heartland and Southeastern conferences are distinctively stronger than the Atlantic and Eastern conferences, while the Western Conference falls in the middle. 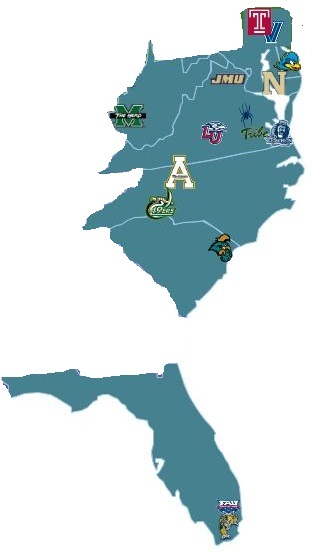 Admittedly, the Eastern and Atlantic conferences do appear a bit weak on paper. Still, both of those leagues have their fair share of premier power programs as well as some up-and-coming programs that have the resources to be successful in the future. 11 of the 15 Tier 1 teams in the Atlantic Conference and eight of the 15 Tier 1 teams in the Eastern Conference have had at least one nine-win season in the past five years. Plus, both leagues are led by two really strong headline programs: the past two national champions—Ohio State (Eastern) and Florida State (Atlantic). 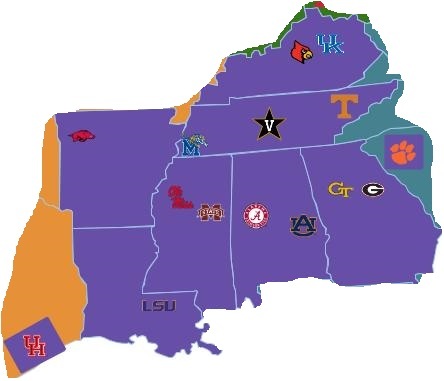 The conferences may not be perfectly balanced in terms of overall strength, but overall, I believe the five leagues I created would work well from a competitive standpoint on a national scale. I find the annual promotion/regulation and transition between tiers to be one of the more interesting facets of this conference structure. It’s a system that gives meaning to the seasons of even the worst Tier 1 teams, as they’ll always be playing to avoid a demotion at the end of the year. Though it’s impossible to tell how the teams would have fared in 2014 if this system was in place, judging from the raw data and rankings from this past season to quantify each team’s overall strength, here’s a look at the projections of the five Tier 1 teams that would have been demoted and the five Tier 2 teams that would have won their conference championship and earned a promotion. Currently, the college football FBS regular season is 15 weeks long, starting on the first weekend of September and lasting until the first weekend of December, when the four conference championship games are played (the annual Army-Navy rivalry game is always played as a standalone game the following Saturday). Every team plays 12 regular season games, and receives at least one bye week. In my version, the season starts off with an exhibition weekend in mid-August. The regular season then commences the following week with Week 1 being on the second to last Saturday of the month. The exhibition weekend is when every Tier 1 team hosts a Tier 2 team from their conference for an exhibition game. In a sense, the exhibitions are glorified spring games, since the game results and stats don’t count toward regular season records. However, they do allow Tier 1 teams to work out the kinks and they allow Tier 2 teams to get a nice payday. It’s a better alternative than the current system, which allows top teams to water their schedules down with inferior cupcake opponents in order to rack up easy wins. Here’s a chart that illustrates each conference’s theoretical potential matchups for exhibition weekend. The regular seasons consists of 17 weeks, starting on the second to last Saturday of August and lasting until the second weekend in December. The two tiers of teams compete exclusively against each other. Every team plays 16 total regular season games—14 conference games (one against every other league team from their tier) and two out-of-conference games (one home game and one away game). Every team is awarded one bye week. The first weekend in October and the first weekend in November will be designated as “inter-conference” clash weekends, when teams will face off against opponents from other conferences. Rivalry weekend will be Thanksgiving weekend, when each team will face off against their biggest rival from within their conference. Most of the big rivalries will be preserved and discontinued battles like Texas-Texas A&M can be revived. The regular season will end on the second Saturday in December, and the bowl season will commence on Christmas Eve. The weekend in between will be used to showcase the championship games for the FCS, D2 and D3 levels, along with the annual Army-Navy game. Here’s an example of what the regular season schedule would look like if applied to the 2015 calendar (All dates are Saturdays). The major change to the postseason is the switch from a four-team playoff to a playoff system that features eight challengers (The five Tier 1 conference champions and three wildcard teams). However, there are also other fundamental changes to the foundation of the overall postseason structure as well. Just like the two-tiered conference system, the postseason will also be mainly constructed around a hierarchical format, only this format will be three different levels. As you can see, I’ve added in a Los Angeles Bowl, which is something we’ll very likely see once a new stadium is constructed in the city, and an International Bowl, which is something I’d personally like to see. The idea behind the International Bowl is simple: every year, the game is held in a different major foreign city. Sydney, London, Dublin, Vancouver, Tokyo, Rio De Janeiro, Beijing, Paris, Madrid and Milan are the top 10 destinations that I’d like to see one day host a major college bowl game. Every other major North American sport has taken steps to grow their game and their brand internationally. Now it’s time for college football to do the same. An International Bowl that rotates in different major foreign cities on an annual basis would be a great way to start. I’ve also eliminated bowls such as the Camellia Bowl, the Boca Raton Bowl, the Potato Bowl and the Heart of Dallas Bowl, as I don’t believe any of them has long-term sustainability for success based mostly on attendance figures and fan interest. Since I’d also like to impose a limit of one bowl game per city, the New Orleans Bowl, the Poinsettia Bowl and the Russell Athletic Bowl had to go as well. The result is 33 total bowl games, and 60 total teams competing in the postseason. The playoff consists of the five Tier 1 conference champions, who earn automatic berths, and the three best non-championship-winning teams from Tier 1, who earn wildcard berths. A panel of experts similar to the current selection committee will choose the three wildcard teams, determine the strength of all eight teams and seed them one through eight accordingly. The gold level bowls—National Championship, Fiesta, Rose, Orange, Sugar, Peach and Cotton—are all apart of the eight-team playoff. The national championship game will be hosted in a different city every year. The sites of the six main gold level bowls are eligible to host the championship game, however, if they do bid for a national championship that means they would have to be a quarterfinal host, instead of a semifinal host that year. The six bowls besides the national championship game will all rotate as quarterfinal and semifinal hosts on a yearly basis (with the exception of the Rose Bowl, as I think it would make sense to have that game as a permanent quarterfinal game on New Year’s Day due to the tradition surrounding the event). The quarterfinals of the playoff begin on the night of New Year’s Eve with the 1 vs. 8 matchup in prime time. Then on New Year’s Day, we get the 2-7, 3-6 and 4-5 matchups. Since the calendar changes every year, you can’t have a set-in-stone annual schedule for certain dates. But you can have the basic rule that there must be at least one full week separating the quarterfinals and the semifinals. Depending on how the days fall in a given year, the two semifinal games will be played on the following Monday-Tuesday, or Wednesday-Thursday, each game getting its own night in primetime. The same “one-week gap” rule would then apply to the break between the semifinals and the national championship game, which would be played on the following Monday, Tuesday or Wednesday night. To demonstrate what a potential eight-team playoff would look like, let’s apply it to this past season. If we go by regular season results, the seeds and matchups for a theoretical playoff would have looked like this. *Note: For this example, I used the Fiesta Bowl as a semifinal host instead of the Rose Bowl, since I’d prefer to keep the Rose Bowl as a permanent quarterfinal host so it takes place on New Year’s Day. The rest of the bowl game schedule will be constructed around a pecking order selection system. 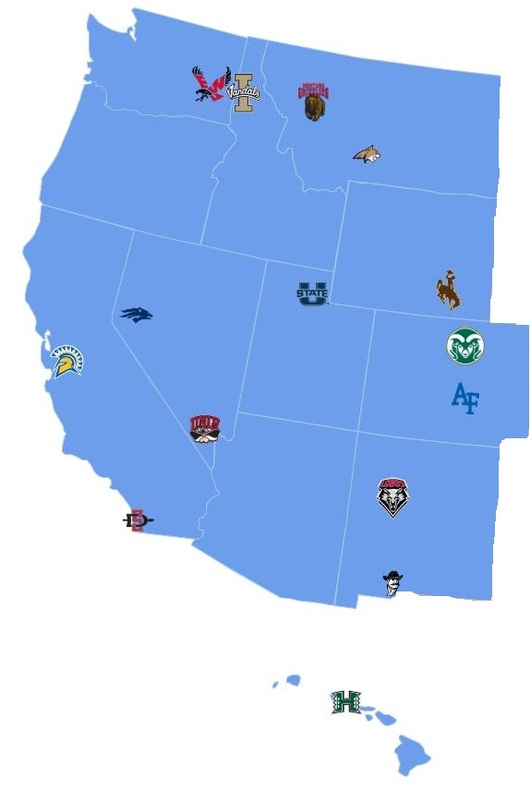 My absolute disdain for the current format of conference affiliations with bowl games is what inspired this idea. 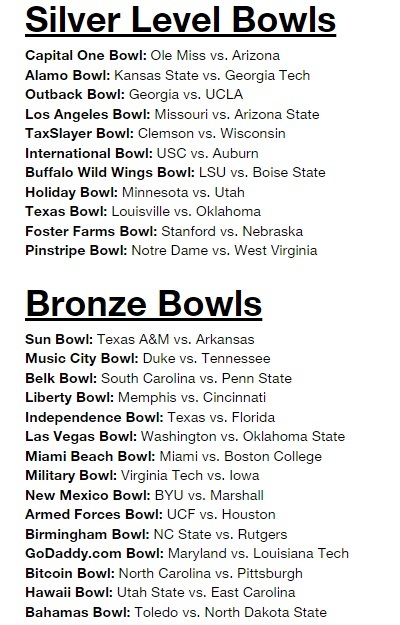 Instead of conference affiliations, each Silver and Bronze level Bowl game will be free to choose the two best teams for their respective game from the leftover pool of postseason eligible teams. The selection will be done in a pecking order format based on the bowl games’ designated total payouts. For this example, let’s say that the theoretical pecking order will be based on how I have the bowls listed above. For the Silver level—the Capital One Bowl has the highest payout, then it descends incrementally to the Pinstripe Bowl, which has the lowest. For the Bronze level, the Sun Bowl has the highest payout and it descends incrementally to the Bahamas Bowl, which has the lowest. The pool of postseason eligible teams will be any Tier 1 team with a winning record along with the five Tier 2 conference champions, who each earn an automatic bowl bid. Obviously, bowls must pick teams from two different conferences to clash in their contests. Admittedly, there are some flaws with this system. A bowl game will likely always favor having a premier big-name program that has a large alumni base in its game over a perceived smaller name program, regardless of record or on-the-field performance. A good example would be if a bowl had the chance to invite an 11-win Boise State team or a seven-win Notre Dame squad, they would likely choose the Irish. In that sense, this type of system isn’t completely fair. But the way way I justify that is that it’s the bowl games and the sponsors that are shelling out millions of dollars in payouts, so they should be able to get the teams they truly want in the event. To better illustrate what the result of a pecking order selection system would look like, let’s apply it to the 2014 season. If we use regular season results and rankings as an indicator of just how strong the teams truly were, this is how the bowl matchups would have likely looked. The 15 bronze level bowls will be played between Christmas Eve and New Year’s Eve, while the silver level bowl games will take place between January 2nd and the day before the first semifinal playoff game. To demonstrate what a potential bowl schedule would look like, here’s what the schedule would have looked like if it were applied to the December 2014-January 2015 calendar from this past season. As I said, I view this article as a starting point and by no means a finished product. Though I believe the system can be easily adapted to all the other major collegiate sports—most importantly men’s basketball—obviously, there would be some logistical changes that would have to be made to each sport’s format. Throughout the offseason, I hope to continue to research, experiment and tweak certain aspects to improve it into a more well-rounded plan. Once I’m satisfied with the result, I hope to one day put it all together into some type of downloadable e-book format that would include a much more fleshed-out and detailed interpretation of what’s been introduced with this version. Thanks for taking the time to read my work. It’s much appreciated.